I love to make pies. Come fall in the Finger Lakes, I am ready to pick my own apples and create some excitement in a pie plate! The Finger Lakes is one spot where new varieties of apples are developed due to the proximity to Cornell University. This makes the Finger Lakes one of the best places for apple picking. For 110 years, Cornell has been developing new tastes in apples. This year, they introduced the SnapDragon and RubyFrost. I am on the lookout for those two. There are other Finger Lakes named apples such as the Empire, Cortland and Monroe. I don’t know that I have a favorite as some are good for eating and others better for baking. But frankly, they are all good. Looking to find apples in the Finger Lakes? Your quest is over! With places like Grisamore Farms, Owen Orchards, and the Apple Station one is guaranteed to find the apple of their eye. Best of all they all offer the ultimate experience in that you can pick your own Finger Lakes bounty! Grisamore Farms offers a wide variety of apples McIntosh, Cortland, Macoun, Red Delicious, Yellow Delicious, Empire, Crispin and Ida Reds. They have 15 acres of apple orchards, so bring the whole family out for picking starting September 15 through October 31. They do provide picking bags or you may bring your own bags or baskets. Additionally they also have carts available to help you transport your apples from the orchard. If you have your own wagon from home feel free to bring it with you, as fall is their busiest season. WOW...and be sure to check out the farm animals too! They have a miniature donkey named Penelope, and a miniature horse named Silver (she stands only 3 feet tall). You can also see many chickens and guinea hens at their farm. New this year, they have two mules named Sally Blue and Kit. They also have a horse named Red and a hinny named Samuel (a hinny is the offspring of a male horse and a female donkey). The Apple Station in Cayuga offers yet another unique Finger Lakes experience. They are also a winery and have a weekly event called Music on the Deck, that offers music, food, and of course wine! They recently had delicious Gala & Jonamac ready in the store & for u-pick. If you are a foodie and are looking for the best apple cider donuts? The Apple Station has some fantasticly fresh, apple cider mini donuts! These donuts melt in your mouth and are hands down a fall favorite! Be sure to check out their store, try some wine, apple cider and donuts. Want more than just their cider and donuts? Try a locavore experience by attending their Apple Harvest Dinner, and let International Chef, Ruben Lopez, introduce you to new and wonderful flavors. Want to hop onto a wagon and venture deep into the orchards? Owen Orchards, offers wagon rides and a wide variety of apples to choose from. This place is definitely a family favorite! Ask any of the locals and they will tell you that Owen Orchards has some of the best apple cider you will find in the Finger Lakes! You can watch the process right before your eyes inside their adorable farm store. You can get cider by the cup, 1/2 galloon or full gallon! Need something a little sweeter? Then have one of their homemade candy apples. In addition to apples, they have a modestly sized u-pick for pumpkins and a wide assortment of pumpkins and gourds for sale as well. This of course is a just a small sample of what apple season has to offer here in the Finger Lakes. If you don&apos;t have the time to pick your own then try to visit any of our roadside stands in the Finger Lakes. There are farmers markets galore that offer our fall bounty! When you visit a farm stand in the Finger Lakes such as Morgan&apos;s Half Acre Produce or The Produce Place, the staff will be knowledgeable about the different varieties and the specific uses. Ask and you will be pleased with your choices. Now the question is what to do with your apple harverst? How about Finger Lakes Apple Pie! My recipe for apple pie is very simple because I am generally lazy. I use a store bought crust and make my own filling for a double crust pie. If you crimp the edges with your fingers no one will even know! It is that easy! 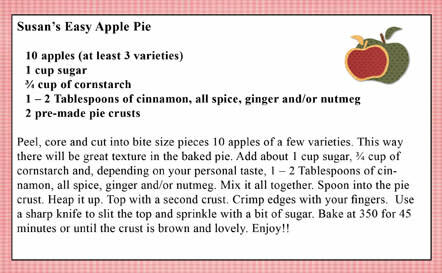 Now here is a great secret - Mock Apple Pie. Do your neighbors leave baseball bat size zucchini on your porch? Did that small cute zucchini in your own garden morph in one day from edible to huge? Cut it into bite size pieces and substitute it for apples! You need to add a bit more sugar, but I doubt anyone will know the difference. I tried this new Mock Apple Pie out and no one was the wiser. A great way to get rid of all that squash, too. Any way you slice it up, the Finger Lakes Region is the place to be no matter what the season.